Do you have a question for Sir Charlie Stinky Socks? If so, please type it in the box below and click 'Send'. Each month, Charlie will answer a few questions and post his responses here. No question is too silly! Ask away! Do you have a question for Charlie? Ask a grown-up to fill in the form below to ask Charlie a question. Your email address is never published nor shared. Required fields are marked*. This will be stored on our website and sent to the author and will only be used to let you know if your question has been answered. It will never be transferred anywhere else or shown publicly. Thank you for all your great questions. I was a little bit scared when I saw all the pirates. But not for very long because I knew everything would be okay once I'd found out what they were really like. I wasn't too worried about the ogre because I really like ogres. Envelope and the good, grey mare were terrified though! My cat Envelope is real. He was actually named after a rabbit called Envelope. But that's a very long story. 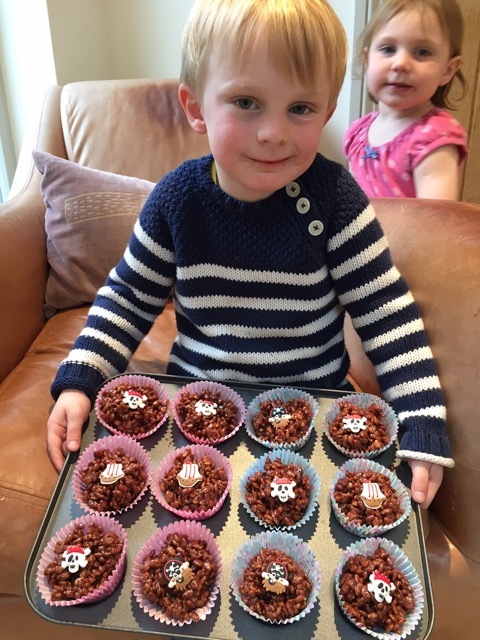 Why don't you have a go at baking your own pirate cakes? Then you could send me a photo of them to put on the website and I'll send you a Sir Charlie Certificate of BRILLIANCE. Have a lovely weekend. I'm on another adventure - inside a volcano this time. Wish me luck. Thank you for the good idea about making some cakes. Here are two pictures of them. I made them with my sister Tilly. We have two further questions. 1. Are you still in the volcano? Is it very hot? 2. When is your birthday. For more Ask Charlie Questions and Answers, check out the archive here!